Curious about some of the latest titles from Fantasy Flight Games? You’ll have your chance to go in-depth with some of our newest releases in four upcoming FFG livestreams—the perfect opportunity for you to learn more about these new games and come hang out with us as we play. We’ll have four livestreams on YouTube over the next few weeks, each looking at a different title from Fantasy Flight Games: Arkham Horror Third Edition, Heroes of Terrinoth, Discover: Lands Unknown, and Cosmic Encounter. In each livestream, we’ll play an entire game, and even if you can't join us live, the streams will be archived on our channel for viewing later. 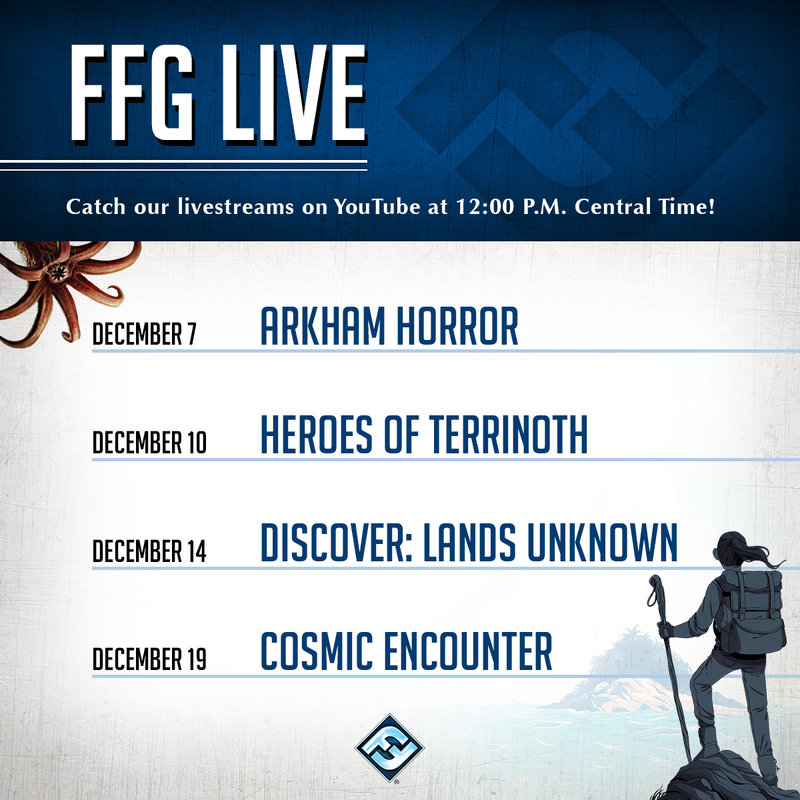 Find the dates for these FFG livestreams below! All livestreams begin at 12:00 PM Central Time. Whether you’re curious about how a new game looks and plays, or you just want to join us for a few hours around a board game table, tune in to our YouTube channel throughout December and catch our gameplay livestreams! Catch the latest gameplay of new and upcoming games with the team from Fantasy Flight Games on FFG Live!